Yesterday has been a bit of a heavier day than the first. Many people where tired at the end of the day and some were also a bit sad to leave after having completed the first 2-days round. On the other hand, to me, it felt good anyway: despite the very traditional format of the lecture, it never got boring and yesterday it even featured a guest speaker. 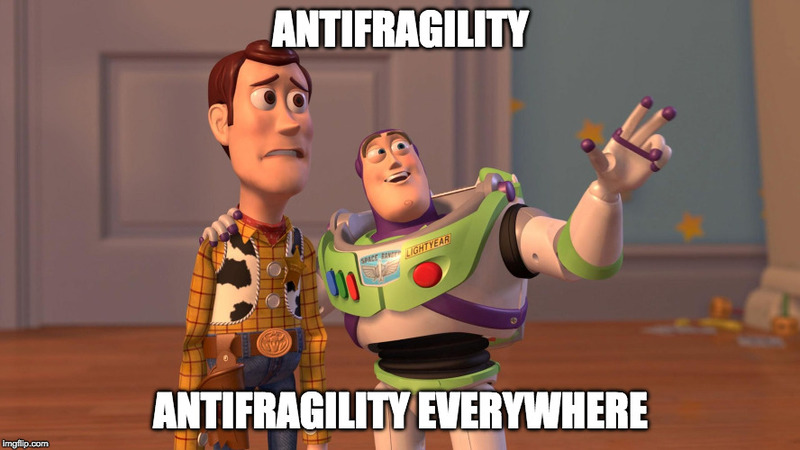 Having dedicated the first day to probability, this second day was dedicated to the subject of antifragility, trying to articulate the concept in as many contexts as possible. In a day full of insights and quotations that I had to censor 🙂 a special note is deserved by Mark Baker‘s session on antifragility in human health: it has been thought-provoking and its digestion will require weeks. Of all the rest, I will pick up the best two or three highlights, according to me. An interesting observable pattern about (anti)fragility is that bigger things are more likely to suffer from negative stress. It exists a scale factor limit in many systems. They cannot grow indefinitely because some aspects of them will become sooner or later unsustainable for the system as a whole. Nature seems to be well “aware” of these limits. Huge species are definitely less frequent than small to tiny ones: for every bigger species’ individual, like an elephant, there are millions of mice; bigger species cannot simply exist in a non-marine environment due to limits of the ratio between the skeleton bones’ section area and the weight of the individual and the species violating this pattern: for an elephant growing 4 times bigger means featuring legs 16 times thicker; all the huge species of the past, though making their appearance once in a while in the history of zoology, were “selected out” until extinct. No brontosaurus survived the mass extinction. At this point, human beings enter the stage: we seem to be unaware of this natural property of systems. We let our system grow much much more than suitable for them to stay robust — let alone antifragile — and we create a fragile society because of our soft spot for huge upfront-planned systems. Taleb mentioned the nation-states, the bank ecosystem and the fragility creeping into big corporations, as we saw yesterday. On top of this, another systems dynamic incur hindering the development of human-created ones. It is not a bad dynamic in itself, but being not aware of it may be very harmful. While life expectation for ‘gaussian’ entities, like animals, deteriorates with age, systems ruled by the power law — that is, for example, corporations — have an interesting property: the longer they live, the longer they should be expected to live. Think of technology: shelves have been in our houses for centuries and this means it is very likely that our houses will keep on featuring them for as long; Altavista, the most used search engine in the 90’s, didn’t outlive the change of the century. This is called the Lindy Effect and it has interesting implications. If we look at the average lifespan of corporations in the last decades, we notice it’s getting shorter and shorter. Companies based on new technology are unstable, in correlation with the Lindy Effect: if the technology sunsets, so does the company. Companies not based on those technologies get wiped out by deep disruptions of the usual business models. Even more interesting, according to the Lindy Effect, a shorter lifespan makes the life expectation of these new companies… shorter! A part of this second day that I truly loved is the one Taleb briefly dedicated to the impact of tinkering on entreprises’ development and longevity. Not only it comes out that most of the revolutions in science and tech came out of bottom-up tinkering — as opposed to directed research — but it looks like keeping on tinkering is the only way to allow companies to stay aloft. According to Taleb, tinkering generates options and options are the key for them to get robust. More or less this is what I wrote 3 days ago about learning and knowledge workers: you have to keep on playing to stay in the market. Taleb’s point of view on enterprises, though, is limiting their development very much: there seem to be no way for estabilished and big corporations to keep the antifragility of the first steps as a start-up. At their best big corporations can manage to stay robust. This is in striking opposition with Stu Winby’s concept of ambidextrous organisations I learned at a workshop of his in Vienna a few years ago and later mentioned in a brief contribution of mine in Alberto Mattiello’s book Mind the Change. Capire il cambiamento per progettare il business del futuro. According to Winby, organisations could manage to keep high rates of learning by developing two parallel structures of governance: a traditional one to perform standard operations and an interleaved less structured one to keep on tinkering. Well, today the game will get more analytical. While the first two days delivered contents already known — though pleasantly re-arranged in a lively lecture — I don’t really know what to expect from these last three days. No matter what, I’ll be reporting on this blog my impressions. Stay tuned!